KANA LONDON produce beautiful, experimental ceramics and are based not far from our shop in East London. Founded by Ana Kerin, the KANA ethos turns its back on traditional ceramic techniques, and instead Ana creates her own recipes for glazes and hand builds each piece for individuality, resulting in ceramics that have an imperfect beauty. The idea for a collaboration came about after meeting Ana in the shop one hot summers day in 2016, followed by a few more sunny meetings in Ana's studio. The sunshine genuinely did reflect Ana's amazing warm persona. 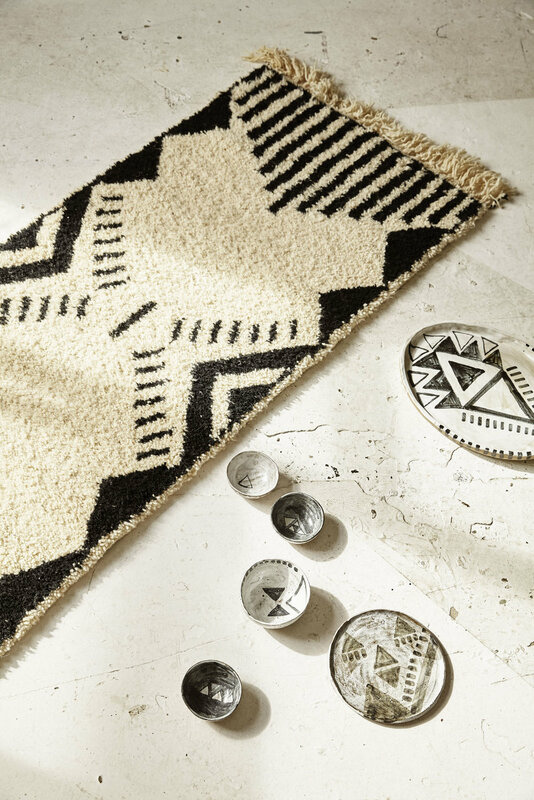 The result was not only a friendship, but also a beautiful collection of individually hand-painted ceramics, inspired by the monochrome geometric patterns from The Rug Trade's Azilal rugs. Each piece, big or small is one of a kind and has its own identity.